Says Stacey Abrams said "Who needs agriculture when you can just get food at the store?" By Ciara O'Rourke on Thursday, February 7th, 2019 at 12:57 p.m.
Stacey Abrams did not say: "Who needs agriculture when you can just get food at the store?" Stacey Abrams, the former Georgia gubernatorial candidate who gave the Democratic rebuttal to Donald Trump’s State of the Union address, has come under fire from some critics for her rebuke of the president. Among the salvos lobbed at Abrams in the hours after both addresses was the charge that she dismissed agriculture, claiming people can buy their food from the grocery instead. "Who needs agriculture when you can just get food at the store?" a Facebook post published on Feb. 5 alleges Abrams said. "Yes, she actually said this and is really this damned stupid." A spokeswoman for Abrams did not immediately respond to an email from PolitiFact about the quote. But it’s not an old claim. 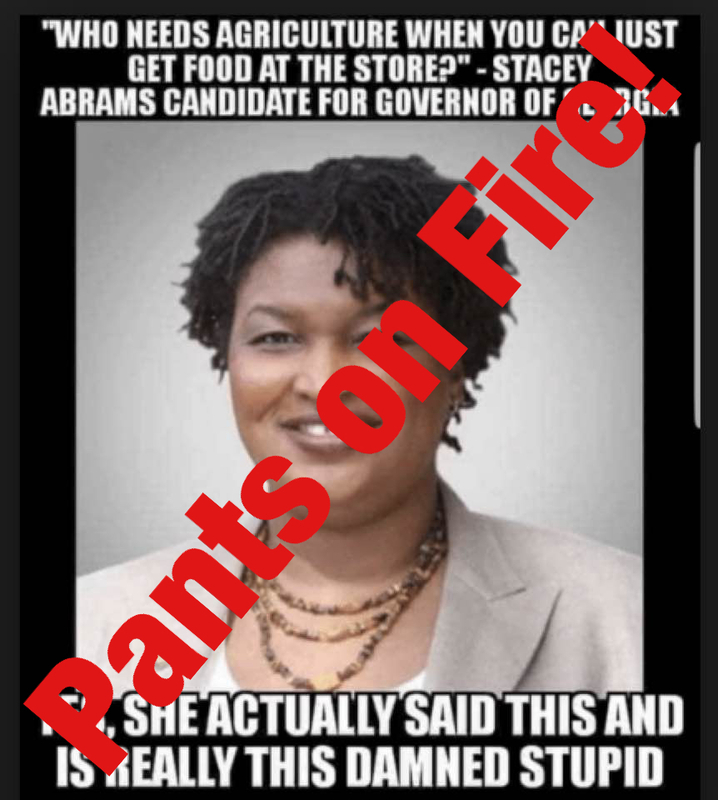 Social media accounts were sharing it back in October, before Abrams lost her bid for governor. Still, we couldn’t find credible evidence that Abrams ever said this. When she was on the campaign trail, though, she did make comments that drew the attention of her opponent, now Gov. Brian Kemp. On Oct. 16, Abrams told a crowd that she wanted to "create lots of different jobs," according to the Atlanta Journal-Constitution. "Because people shouldn’t have to go into agriculture or hospitality in Georgia to make a living. Why not create renewable energy jobs?" An attack ad later featured a clip of Abrams making the remarks, and Kemp’s camp called them "brash and condescending." In response to the criticism, Abrams tweeted: "To be clear, my point is that we must continue to diversify our economy and raise wages across the board. Agriculture and hospitality are vital sectors of our economy in Georgia - but we can do more and lead in new sectors as well." She did not ever appear to clarify a statement on "who needs agriculture when you can just get food at the store" because, as best we can tell, she never said it. Stacey Abrams said "Who needs agriculture when you can just get food at the store?" Published: Thursday, February 7th, 2019 at 12:57 p.m.